Fertigreen granular lime is a high-quality magnesium-containing granulated lime fertilizer for vegetable garden, flower garden, lawn and orchard. Provides a better soil structure and an ideal acidity of the soil. 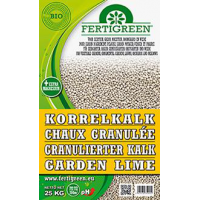 Fertigreen granular lime consists of calcium and magnesium. - Calcium has a positive influence on the soil structure. - Magnesium is essential for chlorophyll operation and also ensures a healthy green color of the leaves. Increases the pH: optimum acidity of the soil promotes better absorption of nutrients such as nitrogen, phosphorus, potassium, etc. At the same time the plant is thus promoted. 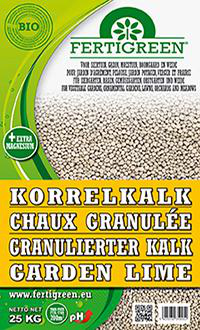 Fertigreen granular lime is easily spreadable and is characterized by its excellent solubility. A fast action is therefore guaranteed. Allowed in biological agriculture according to EC Regulation No 834/2007. In order maintain the lime quantity, liming 10 to 15 kg for 100 m2 is preferred. Autumn and spring are the best times to spread the lime.